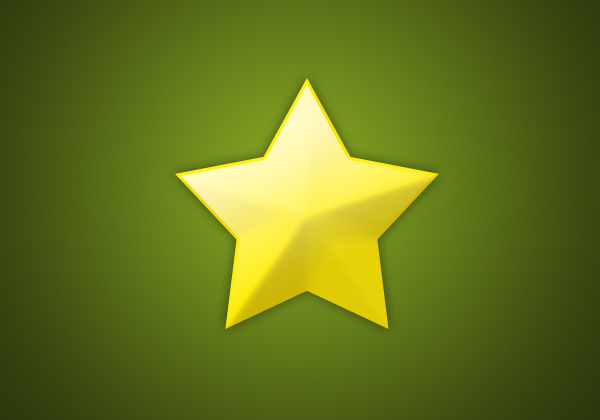 In this quick tutorial I’m going to be teaching you how to use the custom shape tool and a couple of layer styles to create a christmas star decoration. Firstly we need to create a new document – File > New, the size is 600 pixels wide and 420 pixels high. Fill the background with a radial gradient using the gradient tool. 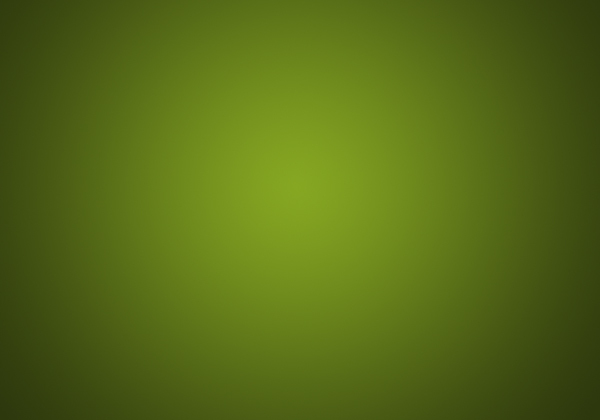 The two green colours I have used are #86a722 and #2d380d. Create a new layer and select the custom shape tool from the tool box (under the rectangle tool – left click and hold to see). Go to the list of shapes and choose a star shaped one and set the colour to white. 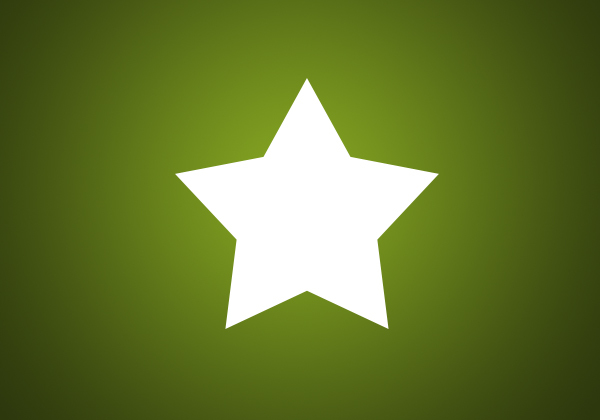 Make the star shape in the middle of the document. 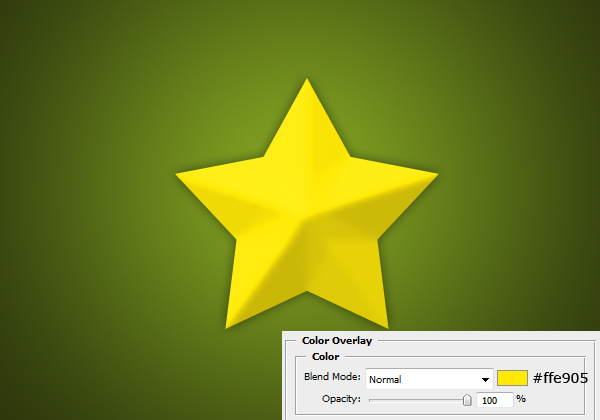 Apply the following layer styles to the star. 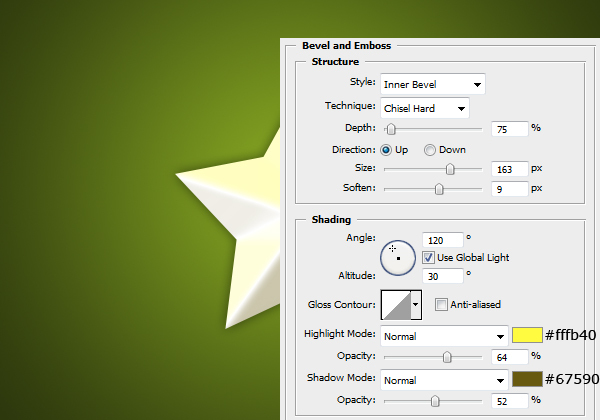 To access the layer styles window right click the layer in the layers window and go blending options. 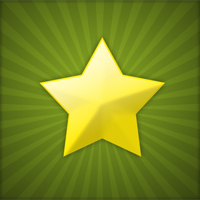 Now we are going to be applying a shine effect to our star, so create another new layer and select the area of the star (Ctrl + Click layer’s icon). Go Select > Modify > Contract by 3 pixels. 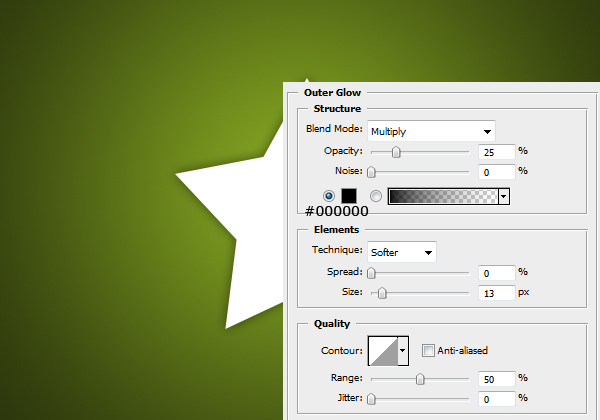 Select the gradient tool and set it to linear and white to transparent. Fill the selection with this gradient so you have something like this. 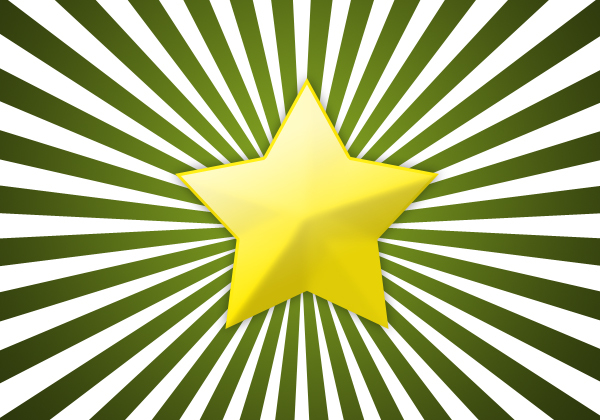 As a finishing touch we are going to be adding a starburst effect in the background so create a new layer above the background layer and make a shape using the ‘registration target 2’ shape so that you can’t see the outside of it. Set the blend mode to Overlay and the opacity to 10% and you are complete. I thought you did a good job with the instructions :) Kudos to you! well, it didnt come out quite like yours, but hey it worked. @rebecca: You could post your outcome, I’d be interested to see how people’s stars turned out. Great tutorial. Step 5 didnt succeed, the background turned yellow. @Ninja: if the starburst shape was yellow (and had the green in the background) this means that the shape’s colour was still yellow from the star, so just set the colour (at the top of the screen) to white. what is the registration shape 2? There are a list of default shapes that adobe bundles into Photoshop, and one of them is named ‘registration shape 2’ which is the one I used for this tutorial. Keep the great tutorials coming PSDCORE! Modify is in grey and unaccessable..
Hey Stevo, so in step 4 you need to select the area of the star (Ctrl + Click the layer’s icon) first (make sure there are the ‘marching ants’ around the star) before you can modify the selection. at the last setup of Bevel! u give the color code a 5 digit but actually the code is 6! Thanks Dante, to create the background on PSDCORE, I took a abstract picture, and used a soft brush to erase around the edges to create a feathered effect. Then I set the blend mode to luminosity so it blended into the background colour without intruding on the rest of the design/content. Select the custom shape tool and beside shape you can click the current shape and it brings up a list of them. To view all of the default shapes click the little arrow to the right and select “All”. Copyright 2008-2019 PSDCORE. All Rights Reserved. The tutorials and articles may not be redistributed without written consent of PSDCORE.